As the owner of the business, how do you know you’re on top of every area in which your business needs to operate successfully? In the same way that certain parts are required to run all cars, certain parts are required to run all businesses. All cars have a frame, gears, and tires, whether it’s Aunt Bertha’s sedan or an Indy racecar. Businesses are the same… every company needs the same elements to be successful: marketing, sales, operations, accounting, HR, and so on. In fact, there are 49 things to get right for success in your small business. At Inspire Results Business Coaching, we spent over 5 years developing a model that applies to every business, no matter the industry. The model contains every required element necessary to run any successful business. Business owners can use this model as a template to help get your arms around all the complex moving parts that make up any business. A comprehensive business template helps you maintain balance across all the fundamentals. In some areas of your business you could be doing extremely well. However, the danger of that is thinking, “Hey, our company is doing well” when in reality, the business is lagging in important areas. 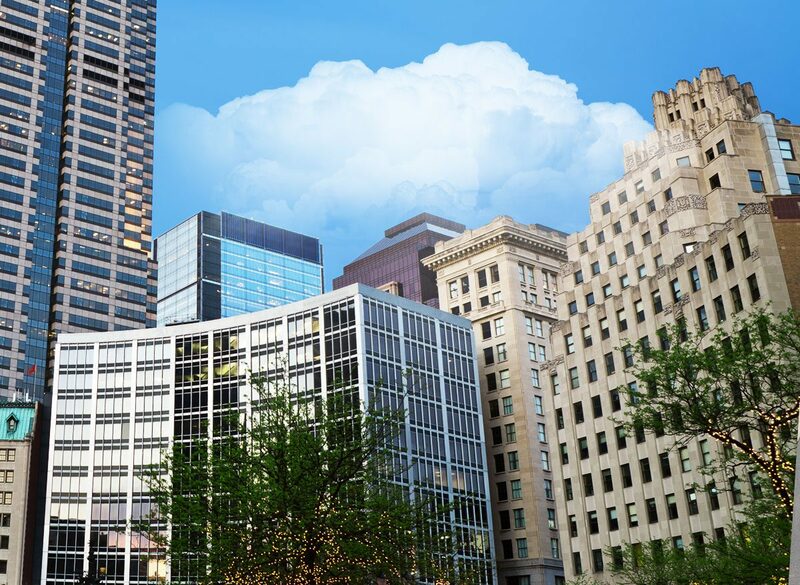 It provides a roadmap, in priority order, of the way forward to continuously insure profit growth. The SERVANT Whole-Business Model is divided into the 7 areas necessary to any business. Each of the 7 areas contains 7 stages which escalate from #1 basic to #7 optimal, culminating in 49 essential elements… 49 things to get right for success in your small business. For instance, to have Optimal Sales & Marketing Results, you first need to Identify Your Ideal Target Market. You’d need to Identify a good USP and Guarantee, and so on. Each component builds on the ones before it. But that doesn’t mean you’ll need to work them in a specific sequence. Some elements you already do well. One of the best benefits of a comprehensive model is that you can assess your business against each element and identify your “low-hanging fruit.” Some elements you’ll spend extra time in because that’s where your trouble spots are. You may have great sales techniques but have ineffective marketing activities so you’re not getting good leads to sell to. The model works across all industries providing business owners with a business “generalist” perspective. You’re good at the business of your company, whether it’s manufacturing vibratory feeder systems or doctoring exotic birds. 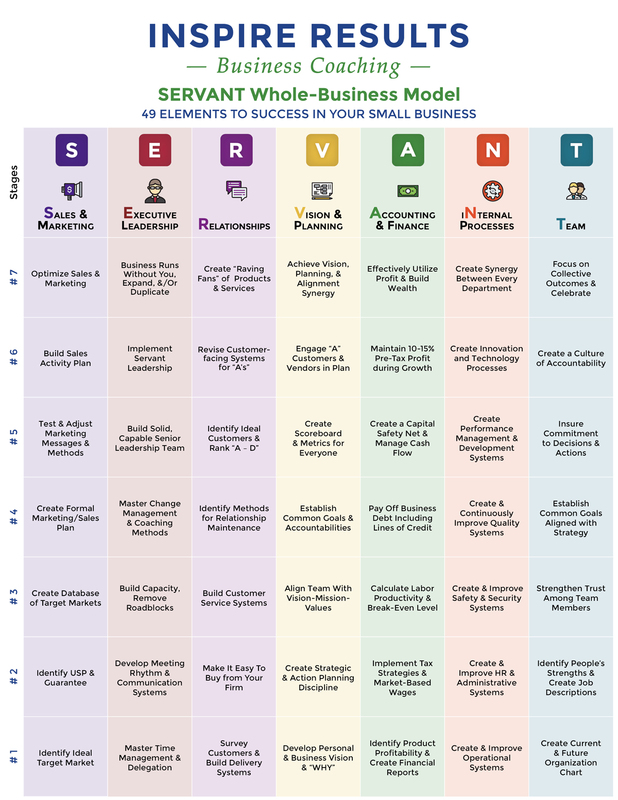 The SERVANT Whole-Business Model helps you be a good all-around business generalist. Throughout 2017, we’ll post here practical ways you can insure that each of the 49 elements are working successfully in your business. Every other week, you’ll find implementable actions you can take…one area at a time. Would you like to sit down with me and together review your business’ performance against the model? Click here to schedule a time or email me at Roger@InspireResults.com. It’s a good exploratory session, it’s no charge, and I guarantee you’ll walk away with solutions to some of those worries that have been keeping you up at night.